Denali, sunrise, Denali National Park, Alaska. I wanted to continue a little with my Denali series. 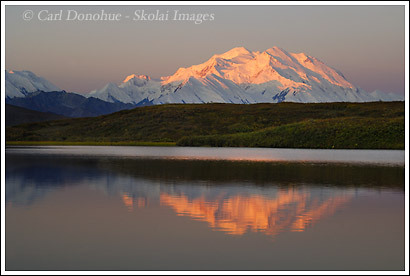 This one I’ve waited for a long time now, and though the reflection wasn’t perfect, it was WAY closer than anything I’ve come close to so far with Denali. Like I said in an earlier post, I’ve camped at this location many, many nights, and rarely even seen the mountain come out – when I did, it was in bad light, windy conditions, and not conducive to decent photography. This trip I did better than ever before. I got up before dawn, dressed in all the clothes I had with me, and headed down to this little pond for some shooting. I waited for the alpenglow to start, all the while bemoaning the ripples on the pond’s surface. A few ducks swam about, making the ripples even greater. I wanted calm, glassy water, and rich warm alpenglow on the mountain. As the light started to make its way down the face of the mountain, the wind slowed just enough and I moved position a little to where I could get some kind of reflection photograph. I got this single composition before the conditions changed and I knew the reflections were gone. So, I headed back up to the small knoll on which I was camped and shot some more images, sans the reflection obviously, from there. Interestingly, the alpenglow didn’t last long. It came, and went, due to some lingering clouds to the northeast of me.Just as the light really warmed up, and saturated the icy face of Denali, it started to fade (the light, not the mountain) and then was gone. About 10 minutes it was back, but the rich tones were gone. Still I couldn’t complain, and I was lucky enough to get a few more mornings with good light too – like I said before these few days yielded far more photos of the mountain than I’ve had in years past. I’ll post another later. I might need to redo a little of the processing, now I got my Photoshop working properly .. I’ll see how I feel about it later. This entry was posted in Adventures, Alaska, Backpacking and Hiking, Denali National Park, Landscapes, Travel on October 16, 2007 by Carl D.
That is such an awesome sight! So beautiful! I wish my Dad was still alive .He would LOVE your pictures, as I do. It really helps me when I’ve had a rough day, & I turn on my computer and travel far away to the most beautiful places & awesome wildlife views through your lens.Thanks for sharing it with all of us !! Have a great day!! I loved your perspective on the history of Denali & how we ALWAYS tend to undervalue the original names of certain places, & the native people also. Personally, I wouldn’t name ANYTHING after a politician!LOL. I love history, too. And like you said, so many times it’s misconstrued. I really worry about the way our beautiful world is headed. I guess that’s one reason I go straight to your website everyday. You present us with such beauty, & I like the background facts, too.You’re a very talented photogragher. Anybody can say they are a photogragher, but you truely are one. I’m glad to hear you enjoy the photos so much, thanks for sharing that, and for your kind words. And yes, it really is an awesome sight, to see this mountain. Unfortunately, politicians LOVE having their names on things .. so most of the money that goes to places like National Parks ends up being for new construction projects, like Visitor Centers and exhibits, not for anything that actually benefits the park – it’s pretty hard to name something “the Ted Stevens Backcountry Ranger Program” for example. On the naming issue, it strikes me at how almost every native name for a place is a description of the place or something like that – one of my favorites in your part of the world is the Nantahala Gorge – “Nantahala” being a Cherokee word that translates as “Land of the noonday sun” – the steep sides of the valley mean the bottom of the gorge doesn’t get much direct sun until the middle of the day. Fortunately, we also use that name for the place, but in general, we don’t do this.